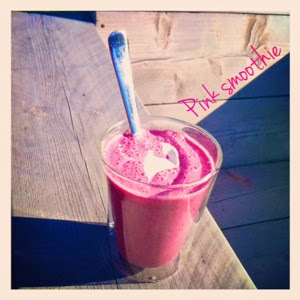 Instead of a green smoothie, a pink smoothie this morning! Thinking there were plenty of bananas & greens I came downstairs. Plenty of greens, but the kind that blend perfectly with banana, or mango for that matter. But NO bananas (or mango...)! On Thursday there were at least 10 of them... And come to think of it we're running out of apples as well! The boys are looking at me with a face that says hey we're eating fruit!!! So true my lovely, health conscious buddies...I'll find something else to blend!